Abstract. Introduced species are widely believed to represent a significant threat to conservation of biological diversity. A better understanding of the ecological factors associated with successful species establishment should lead to improved management and mitigation of these introductions. The "propagule pressure hypothesis", implying a greater chance of successful introduction with greater numbers introduced, has been widely accepted as a principal ecological factor in explaining establishment of exotic species. The historical record of bird introductions in a few locations, including the state of Victoria in Australia, has been advanced as the principal quantitative support for the hypothesis. We compiled lists of bird species introductions into Australia from several sources, and discovered inconsistencies in the records of introductions. In a series of comparisons, we found that the historical record of passerine introductions to Australia does not support the propagule pressure hypothesis unless superfluous introductions of already successful species are included. An additional problem with previous analyses is the inclusion of unsuccessful haphazard cage escapes. Two weavers were included in this study, the Southern Red Bishop introduced in South Australia and the White-winged Widowbird to New South Wales. 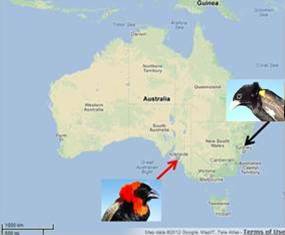 The Southern Red Bishop was first reported in 1926; in 1933 a small colony was found near Adelaide and still present in 1947. The White-winged Widowbird was released in New South Wales in about 1931, possibly as escapees from the ship wreck Malabar. There have been intermittent published reports up to 1968 around Windsor on the Hawkesbury River.